The ENNEAGRAM (nine points) is a personality system that presents a useful template or map for understanding ourselves, the important people in our life, and the groups we work with. It describes nine ways of processing and responding to the world– a full spectrum of personality styles. We view the world through lenses which either bring great clarity or various degrees of distortion to our vision. The Enneagram enables us to look at our lenses instead of just looking through them. The Enneagram works like a psychological/spiritual lens check. It sorts out the encouraging and discouraging voices in our head. It helps us grasp our inner motivations and drives. go to the Advanced Enneagram Training and other workshops I offer. 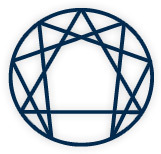 Use our online Ennea-Graph to instantly compute your Enneagram type. We typically view the world through lenses but usually don’t examine the lenses themselves. From time to time we need to check our glasses to see if they are filtering the world cleanly or are distorting our vision. Nine Lenses on the World: the Enneagram Perspective provides a lens check to discover whether we are viewing the world accurately as it is or altered, like our world view believes it should be. Intended for a general audience, this thorough yet brief guide through the Enneagram system provides a clear common sense outline of each of the nine styles. The resourceful characteristics and ideals of each style are contrasted with their non-resourceful idealizations. For example the Good Person’s passion for excellence can become a maladaptive pursuit of perfectionism. The adaptive energy, or virtue, of each style is contrasted with its maladaptive energy, or vice.